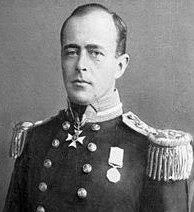 One of the most tragic episodes in the history of Antarctic exploration was the Terra Nova Expedition headed by Royal Navy Captain Robert Falcon Scott. Scott's party reached the South Pole on January 17, 1912, only to find that they had been preceded by Roald Amundsen's Norwegian Expedition. On their return journey, Scott and his four comrades all perished from a combination of exhaustion, starvation and extreme cold. Initially, 1p stamps of New Zealand were overprinted for use by the Expedition, as they had been for Shackleton's earlier 1908 Expedition. However, since the postage to certain countries was 2 1/2p, 2,400 1/2p Yellow Green stamps were also overprinted "VICTORIA LAND" (Scott #130d), making this the scarcest of all of the New Zealand Antarctic Expedition overprints. Scott values it unused at $ 1,100.00 and used at $ 950.00. Covers are rare. 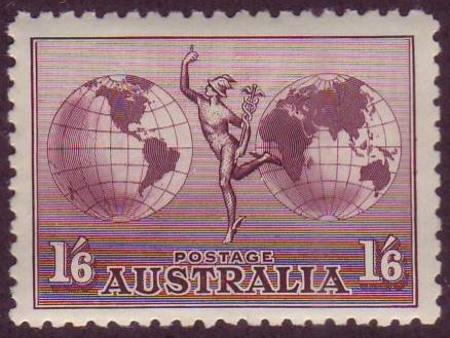 The stamp appeals to both collectors of New Zealand and Antarctic topicals. As it's an overprint, it should be purchased conditional on obtaining expertization. Stamps of New Zealand are collected both domestically and by British Commonwealth collectors worldwide . The nation has a stamp collecting demographic similar to Great Britain's, and the demand for better material should increase dramatically as population aging accelerates. The percentage of New Zealander's aged 60 and over is projected to rise from 18% in 2009 to 29% in 2050. In 1909, the U.S. issued a stamp in celebration of the Alaska-Yukon-Pacific Exposition (Scott #370), along with an imperforate version (Scott #371), which is far more scarce. Both stamps portray William H. Seward, who, as Secretary of State, purchased Alaska from Russia in 1867 for $7.2 million (about 2c per acre). 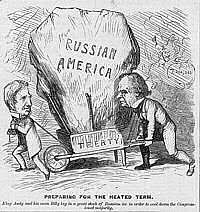 At the time, some Americans scoffed at the purchase, and called it "Seward's Folly." 525,400 of the imperforate stamps were issued, and Scott '10 prices the stamp unused at $17.50 ($37.50 for NH). I believe that the best format in which to purchase these is as plate blocks of 6 (Scott '10 CV=$225.00 for unused, $350.00 for NH) or as centerline blocks of 4 (Scott '10 CV=$175.00 for unused, $300.00 for NH). As these were issued in panes of 70, only about 7,500 of each of these positional blocks were issued, and many were probably broken up. This issue is interesting because as an Alaska Topical and item of interest for Alaska memorabilia collectors, it represents a bet on the economic development of the state, America's "final frontier"- rich in natural resources and with vast potential for economic growth. 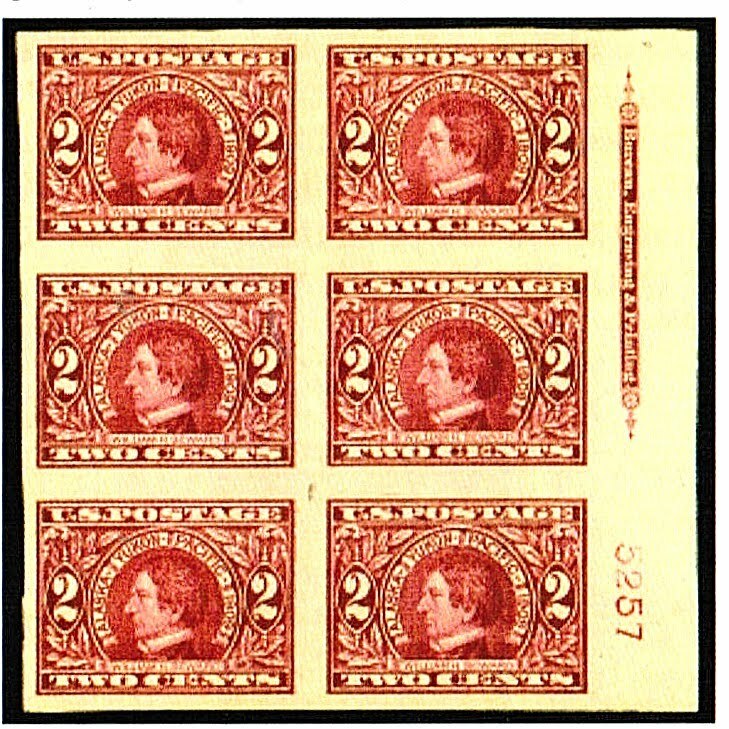 As with the Hudson-Fulton imperforate recommended earlier, gum bends are a common condition problem with this issue, so endeavor to select blocks that are free of them. 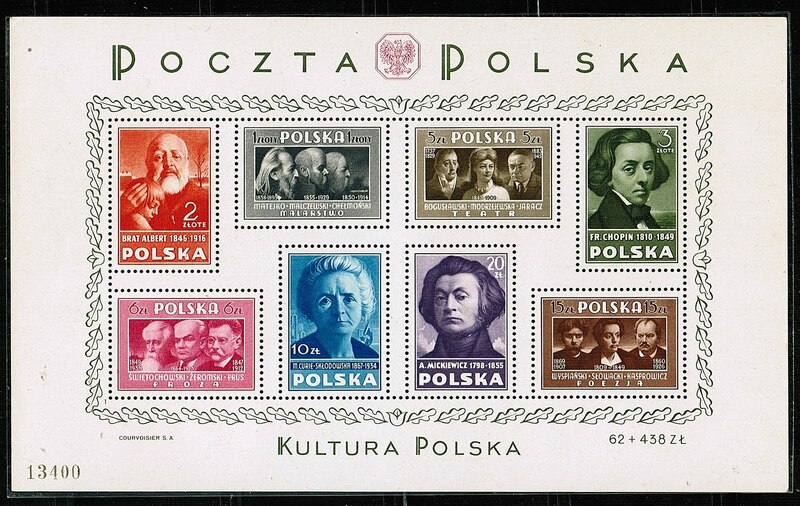 In 1947, Poland issued a colorful souvenir sheet honoring Polish Culture, and featuring famous Poles, including Frederic Chopin and Marie Curie (Scott #412A). Only 50,000 were issued, and Scott '10 prices the souvenir sheet at $ 210.00. With 38 million people, Poland is one of the fastest growing economies of all of the former Communist countries, with annual GDP growth averaging 5.5% over the past 5 years. The nation has steadfastly pursued a policy of economic liberalization, and was not severely impacted by the recent global financial crisis. It is likely that Poland will be one of the world's fastest growing economies over the next several decades. In addition, there are some 10 million Polish Americans with ties to the country. 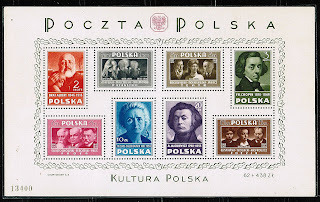 Better stamps of Poland will rise in value as the country prospers and the population of Polish stamp collectors increases. Interest in Polish history and national pride are important elements in the culture of this oft-conquered people, and I am a big believer in taking into account the thematic interests of a collecting population when assessing the investment potential of an item. Those interested in joining a community of stamp collectors, investors, and dealers are welcome to join the "Stampselectors" group at Facebook. The group provides an excellent venue for trading stamps with members from around the world, as well as being a forum for discussion of stamp investing and practical aspects of collecting. 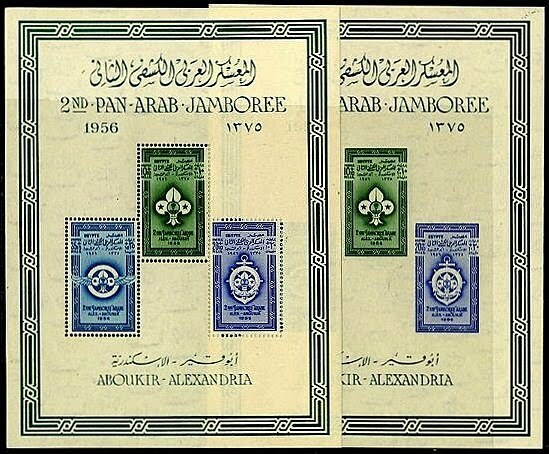 In 1956, Egypt celebrated the 2nd Arab Scout Jamboree by issuing a set of semi-postal stamps (Scott #B13-15) and a pair of souvenir sheets (perf. and imperf. - Scott # B15Note) Only 3,800 sets of the souvenir sheets were issued, and Scott '10 prices them unused at $1,500.00 . 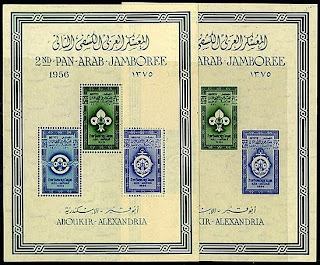 These scarce souvenir sheets have dual market appeal as Boy Scout Topicals issued by an emerging market country for which I feel bullish about the stamp market. Worldwide membership of the Boy Scouts is estimated at 25 million, and Scouting topicals are extremely popular internationally. With an estimated 76 million people, Egypt possesses one of the most developed economies in the Mid-East, with a GDP growth rate of 5%-7%. The government is undertaking major economic reforms to further spur development, including massive investments in infrastructure and liberalizing economic and tax policies to encourage foreign investment. Egypt's main challenge in the years to come will be one of social and political democratization - how to assure that enough of the new wealth trickles down to the majority of the population to lessen the problems of poverty and political instability. Nevertheless, barring major political instability, it is likely that Egypt will be one of the fastest growing economies over the next several decades. In 1996, Kazakhstan issued a set of stamps picturing butterflies (Scott #161-64). 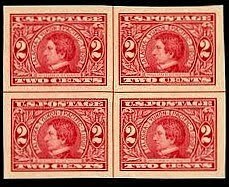 Only 25,000 sets were issued, and Scott '10 values the unused set at $ 3.30. Butterflies are among the most popular sub-categories of Animal Topicals, and that, combined with the inexpensiveness of the set, makes it a very low-risk speculation. 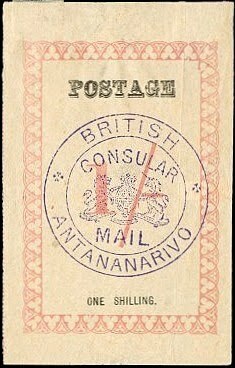 Between 1884 and 1886, the British Consulate in Madagascar, then a French protectorate, produced stamps for use by British citizens residing there (Scott #1-58). At the time, the island was rife with disputes between the two colonial powers and also with the native population which, oddly enough, wished to govern itself. $ 12,000.-. Covers are extremely rare. These stamps are highly prized by British Commonwealth collectors, and should be considered a conservative investment. There is the possibility that there might eventually be a demand for them in Madagascar, but probably not for a long while. 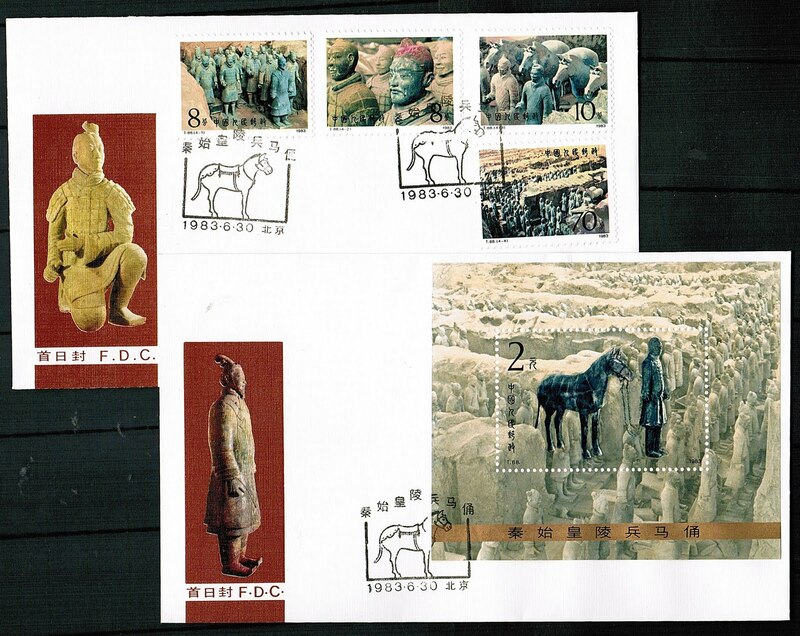 Were a stamp market to develop there, however, the values for these stamps would soar. A nation of 20.6 million people, the Republic of Madagascar remains a poor, though rapidly developing, nation with considerable growth potential. It is still heavily reliant on agriculture, although potential sources of growth include mining, petroleum, light manufacturing, and tourism. The government has embarked on a course of financial reform, including aggressively seeking foreign investment. Annual GDP growth has averaged 3% over the last 5 years. Condition-grading is perhaps the most important skill that anyone who wishes to engage in the business of buying and selling stamps must learn. 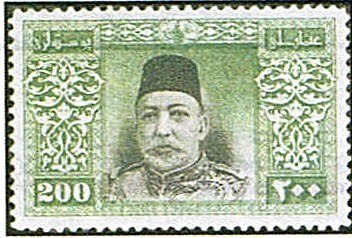 Beginners and those outside of the hobby are often surprised to learn that depending upon its condition, a stamp may sell for as little as 2% to as much as 100% of its catalogue value, or more. This is particularly true of U.S. stamps. Due to the current grading fetish (described in an earlier article), some U.S. stamps graded XF or higher have sold for multiples of their catalog values. So-called "condition-rarities," graded Superb or "Gem," have even sold for hundreds of times their Scott values. Many beginning collectors make the costly mistake of purchasing overgraded stamps - stamps which have been described as being in better condition than they really are. While most stamp dealers and auctioneers are honest, there are some who intentionally overgrade stamps, and some who even alter stamps so that they appear to be in better condition than they are. Most dealers are not blatantly dishonest, but there are many who accidentally overlook defects, or are somewhat "liberal" when grading stamps which they are trying to sell. Also, some issues are notoriously poorly centered, and are graded on a "for issue" basis- for instance, "Very Fine for issue. " To an extent, condition-grading is more of an art than a science. 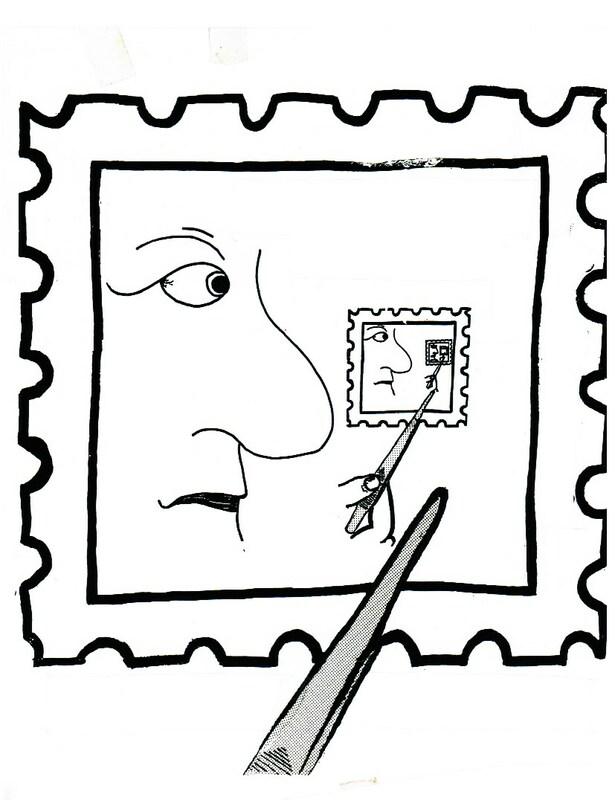 When examining a stamp, the obvious first step is to look at its front. Centering is the first consideration. 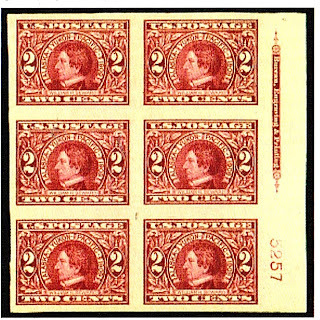 Pictured above are four 2c Washington stamps which grade from Average to Very Fine. Note how the perforations cut into the design at bottom of the first (Average) stamp. The perforations clear the design of the second (Fine) stamp, but are still close to the design at left and on the bottom. The third (Fine to Very Fine) stamp is better centered than the second, and the fourth (Very Fine) is the best centered of the four. Two higher grades also exist - Extremely Fine (almost perfectly centered), and Superb (perfectly centered). 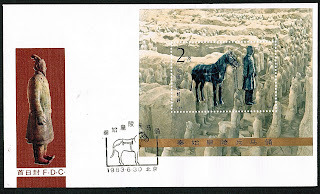 Unfortunately, the author did not possess XF or Superb examples of this stamp to scan. 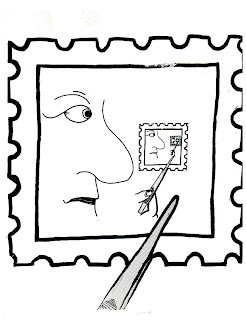 Other criteria also apply when examining a stamp, such as whether the stamp has a defect or fault. 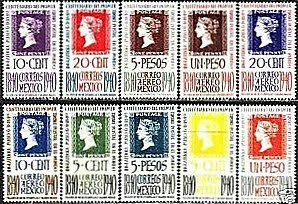 Defective stamps are known as seconds, because they are the "second choice" of most collectors, who generally would prefer to own a sound, fault-free stamp. Nevertheless, the frontal appearance of a stamp is important in determining its value, even if it is faulty. A second which appears to be Very Fine is worth more than a second which appears worse. Among the defects which are obvious from the front are faded or oxidized colors. Fading is usually caused by excessive exposure to light over a long period of time. Oxidation is a chemical process which effects certain types of inks, and causes them to rust. Reds and oranges often take on a brownish color when they oxidize. Other considerations include whether the stamp (if used) has a killer cancel which obstructs much of the design, abrasions, pin-holes, short perfs, tears or pieces missing, creases, stains, or inclusions. 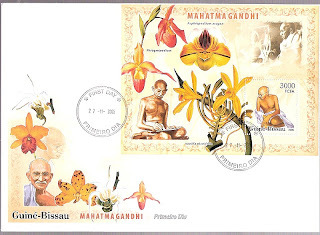 Inclusions are contaminant particles inadvertently mixed into the paper when it is being produced, and if such particles are large enough to be obvious, they can detract from the stamp's value. When examining old stamps, especially those without gum and for which the catalog value is much greater for unused than used, it is always prudent to look for indications of chemically-removed cancels. These may be difficult to detect, but a UV light will sometimes reveal traces of them. The next step in the process is to turn over the stamp and examine its back. If the stamp is unused and was issued with gum, then gum condition will be an important consideration. The highest grade for gum is OG NH (original gum, never hinged), followed by LH (lightly hinged), OG (more heavily hinged), HR (hinge remnant) and No Gum. A stamp which is NH, but with disturbed gum, will be worth less than a NH stamp with pristine gum. Sometimes gum will appear brown or toned. 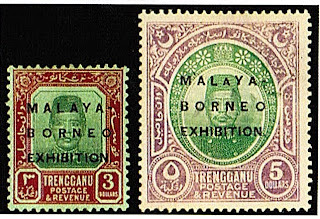 Often, stamps which were stored under conditions of high humidity have toned, or tropicalized, gum, and toning can detract from the value of a stamp, especially if it is heavy (dark) or affects the paper as well as the gum. Another type of defect of which to be aware when examining the back of a stamp is known as a thin. A thin is actually an abrasion of the back of a stamp, usually caused by careless removal of a hinge, or by heedlessly pulling the stamp off of something to which it was partially stuck. In effect, a part of the stamp's paper has been torn off its back and rendered "thinner" than the rest of the stamp. Larger, deep thins detract more from a stamp's value than smaller, shallower ones. The best way to detect a thin is to place a stamp in a black watermark basin (front side down), pour in some watermark fluid, and then observe whether a portion of the stamp appears darker than the rest of it. Of course, if the stamp is watermarked, one must take into account that the watermarked area will also appear darker, even if there is no thin. Occasionally one may also find a stamp for which the seller has attempted to conceal a thin, either by attaching a heavy hinge remnant to it, or by writing over it in pencil. When purchasing an expensive stamp, the buyer should require expertization as a condition for purchase if he has any doubts whatsoever about either a stamp's authenticity or its actual condition. Most issuers of certificates will comment on a stamp's condition as well as its authenticity, and a few actually grade stamps. While there is nothing wrong with selling a repaired or altered stamp as long as it is described as such, there are dishonest individuals who profit from misrepresenting such stamps as being in their original condition. Repairing stamps is a lucrative business in Europe, especially in Germany, and there are practitioners of the trade who do a pretty convincing job of repairing tears, ironing out creases, filling thins, removing cancels, and regumming stamps. To an extent, developing an instinct or "gut-feeling" about when a stamp's authenticity or apparent condition seems questionable requires time and experience, but hopefully this article will serve as a start for those who are new to the game, and will make the learning experience less of a "school of hard knocks." In 1934, the Soviet Union issued a strikingly modern set of five Zeppelin stamps (Scott #C53-57), which were intended for use on one of the South America flights of that year. 40,000 sets were issued, and Scott '10 values the unused set at $ 505.00. The set strongly appeals to both collectors of Russia and of Zeppelin stamps. Zeppelin stamps and covers are extremely popular among "Zepp" collectors and Aviation topicalists, especially in Europe. Those issued by destination-countries which are likely prospects for rapid economic development are compelling investments, in my opinion. 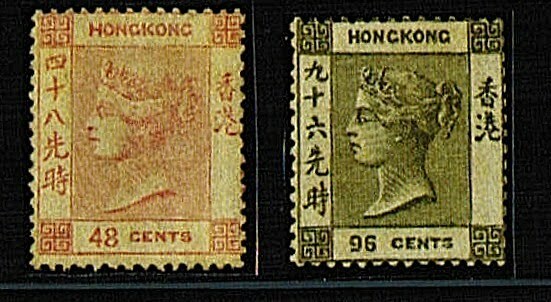 In 1862, Hong Kong issued its first postage stamps (Scott #1-7). The two high values are particularly scarce, but also pricey. The 48c Rose (Scott #6) had a printing of 31,260 and the 96c Gray (Scott #7) - only 21,600, and Scott '10 prices them unused at $ 3,000.- and $ 4,000.-, and used at $ 400.- and $ 525.- , respectively. 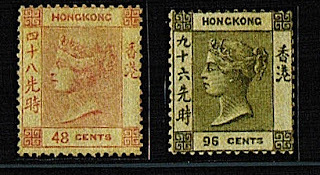 I favor all of the better stamps of Hong Kong, as they appeal to collectors of China, Hong Kong, and British Commonwealth - three growing markets. 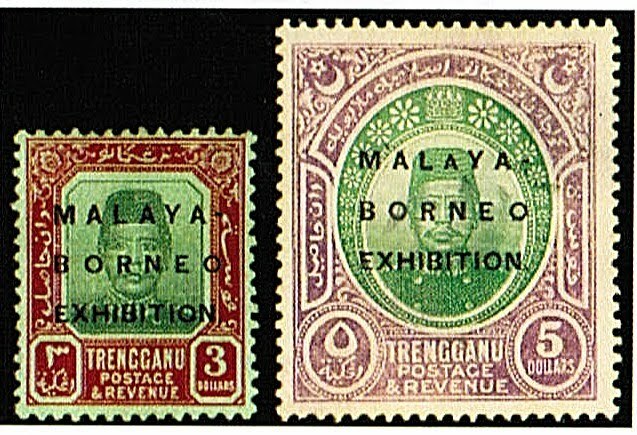 While these two stamps may seem expensive, it is likely that only a few thousand remain in any condition. 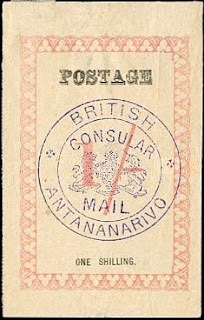 If buying them used, ascertain that they have postal, and not revenue, cancels, and obtain a certificate if necessary. Centering of this issue tends to be poor, so expect to pay a premium for examples with four margins.